The story of the discovery of silver on a small reef in Lake Superior and how entrepreneurs and miners developed it into the first silver mine in Ontario predictably has different versions. 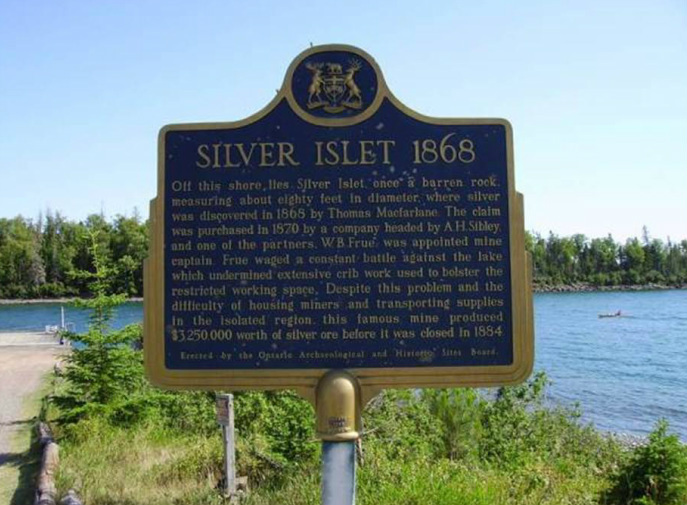 According to an Iron Mountain Press story, silver was accidentally discovered on Silver Islet, a reef on the rocky Lake Superior coast at the tip of the Sibley Peninsula in northwestern Ontario, Canada. The Sibley Peninsula itself is a 32 mile long, 6 mile wide peninsula in Ontario, Canada that projects into Lake Superior from its north shore and separates Thunder Bay to the west from Black Bay to the east. Once upon a day in May in 1868,two men huddled together on a small reef about 20 feet long and only eight feet above the beach on the far northwestern Ontario shore of Lake Superior about a mile from the mainland. Lake Superior waves chased each other, combining to form mountainous white crests that pounded against a tiny reef about the size of a beach towel. A light yawl tied to a bush at the fringe of the reef snapped its hawser and the wind and waves picked it up and tossed it like a sea gull on the waves. The two men on the reef had been prospecting and the yawl was their only transportation to the mainland a mile away over the mountains of waves. As the storm increased in violence the men were astonished to discover silver nuggets. At last the waves rushed over the crest of the reef and the larger and stronger of the two men, a Cornish miner with a stout heart, put the slender man underneath him and sat on him to keep the waves from washing him away. The two men spent the night battling the waves that sometimes completely buried them. When the cold dawn broke, the waves receded and the friends on shore who had given up all hope of ever seeing their comrades again, took heart and managed to get out to the reef and rescue them. The rescued men hung on to their silver nuggets and resolutely decided to search for more. Another version of the story comes from the Montreal Mining Company which had sent John Morgan and his partner Patrick Hogan to search for lead-galena samples. John Morgan threw himself flat on the ground when his partner Patrick detonated explosives to free ore from the rocks. John‘s outstretched hand touched Lake Superior water and when he looked down he saw several silver nuggets. Within a week, John and Patrick had sent several hundred pounds of silver ore to Montreal aboard the steamer Algoma as well as details about a silver vein running northwest from the reef toward the mainland. Yet another version of the discovery story comes from the biography of Thomas Macfarlane, who explored the mining country of Lake Superior for the Montreal Mining Company. In 1868, Thomas Macfarlane discovered Canada’s first major silver deposit on a reef in Lake Superior that he called Silver Islet. Using his European contacts he recruited Norwegian miners to extract the silver while at the same time managing The Wyandotte Silver Smelting and Refining Works at Wyandotte, Michigan, during the 1870s, although his connections with Silver Islet were sporadic. However and whoever discovered the silver on Silver Islet, after two years of attempting to establish a mine to collect the silver, the Montreal Mining Company declared the mine “an engineering nightmare.” In 1870, Montreal Mining Company sold their land and patents to Alexander H. Sibley’s Silver Islet Mining Company for $225,000. Alexander Sibley of Detroit headed the company and he appointed W.B. Frue as his partner and mine captain. The sale documents also reveal that Detroit merchant Eber B. Ward, merchant Edward Learned of Pittsfield, Massachusetts, contractor Peleg Hall of New York, and merchant Charles A. Trowbridge of New York were also partners in the transaction. Born in Detroit, Michigan, on October 17, 1817, Alexander Hamilton Sibley was the son of Solomon Sibley, Detroit’s first mayor and the brother of Henry Hastings Sibley, Minnesota’s first governor. After Alexander became president of the Silver Islet Mining Company in 1870, he and his family lived in Detroit and spent their summers at the mine. Sibley’s partner William B. Frue, built them a three story home and Marie Louise Miller Sibley had her piano shipped from Detroit every summer. He died in New York City in 1878, with his partner William B. Frue by his side. The Sibley Peninsula is named for Alexander Sibley. In September 1870, William Frue and his engineers arrived on Silver Islet along with two horses, mine machinery, a scow, a raft of timber, supplies and thirty men. The men worked 18 hour days building timber breakwaters, foundations, and a coffer dam around the vein of silver, allowing miners to take out about 70 tons of silver ore.
Montreal Mining engineers and Silver Islet Mining Company mine captain W.B. Frue and his men waged an unrelenting battle against Lake Superior. The Silver Islet Mining Company went to work constructing wooden breakwaters around Silver Islet to combat Lake Superior waves. The Silver Islet Mining Company used crushed rock to expand the Silver Islet to over ten times its original size and it built a small mining town on the nearby shore, but Lake Superior waves were a constant, threatening presence whether in liquid foamy form, freak tidal waves or ice surges. William Frue and his engineers decided that a cribwork had to be built on the tiny reef and they immediately offered a reward to any man who could locate a stand of Norway pine within hauling distance. After diligent searching, a mine employee discovered a stand of pines that had withstood fires and ravages of nature. A group of axmen cut down the pine trees and with great difficulty hauled the timber to the reef. Again, they faced challenges. Solid rock provided their only foundation, rock which slanted and in some places formed a sheer cliff that extended to the bottom of Lake Superior. After working eighteen hour days for a month, the laborers had built nearly 1,800 feet of cribbing, bolted it securely together and filled it in with huge rocks. The cribbing measured some thirteen feet deep and weighed several tons. On August 26, 1870, a gale from the southwest ripped away 200 feet of this crib work. By October 1870, Lake Superior waves had shredded half the breakwater and the miners rebuilt it to 26 feet wide, twice its original width. Incessantly busy, Lake Superior waves destroyed much of the cribbing before Christmas 1870, claiming 3,000 tons of rock. Spring brought new onslaughts of Lake Superior waves. In March 1871, the Lake Superior waters of spring ripped away more than 50,000 feet of timber cribbing fastened with iron bolts. On March 8, 1871, armies of waves rushed in carrying large ice cakes and slamming them into the crib work. The huge timbers bent and broke like slender reeds. Waves washed away over 50,000 feet of timber and 6,000 feet of rock from the reef. Along with the crib building, the Silver Islet Mining Company also mined silver, and the miners, numbering about twenty at a time, extracted over $100,000 worth of silver while it built the preliminary crib work. After and between the storms, the miners and laborers rebuilt the breakwaters and cribs and during the summer of 1870, the miners took out nearly a million dollars in ore. In 1871, the mine yielded 600,000 dollars worth of silver ore and in 1872, the miners extracted $426,000 worth of silver ore.
Miners, mine operators and their families slowly came to Silver Islet, as Thomas Macfarlane had christened their reef. They faced nature’s challenges just making their way to Silver Islet. In the early days of mining, there were no railroads within 500 miles of Port Arthur. All supplies including the materials needed to build and work the mine had to be shipped in by boat. The winter of 1870 proved especially difficult for the miners and their families who were obliged to endure frigid temperatures and ferocious winter storms while living in tents. Mail delivery often resembled an Arctic expedition. Indian runners using dog teams followed the Lake Superior shore from Duluth, Minnesota, a small town in at the time. From Duluth, the Indians and the dog teams brought the mail north, about once a month, fighting their way through a dense 200 mile wilderness in sub zero winter temperatures. The mine was shut off from civilization from November to May. In the summer of 1871, the Silver Islet Mining Company built the mainland town of Silver Islet Landing and a breakwater, basin, and wharves in the harbor. The company built its own lighthouse and range lights to guide the ships vital for its survival into Silver Islet. The underground mining operations continued to expand deep underneath Lake Superior, and so did the above ground equipment. The company built a shaft house, engine house, rock house and pump house to keep the shaft from flooding. By the end of the summer a breakwater with a 75 foot base and 18 foot bulkheads holding 50,000 tons of rock rubble surrounded Silver Islet. On the mainland, the Silver Islet Mining Company built a long row of houses stretching in a semi circle along the shore of a beautiful bay called Camp Bay, back dropped by a range of low mountains. The company provided houses for hundreds of men and their families, a huge store house, a large and roomy hotel, and a large stamp mill. The company spent $100,000 to build the stamp mill which in less than a year turned out $225,000 worth of silver rock. The company built a heavily barred jail for drunken and roughneck men. There were two churches, one on the curve of Camp Bay and the other farther down the bay, nestled in aspen and birch trees and Scottish rowan. On the reef were a man- made island, a huge shaft house, a power house, and other necessary buildings for operating a mine. There were house barracks for the miners without families that could accommodate at least 300 men. Mine captain William Frue constructed a three story house on Camp Bay for President Alexander Sibley. He organized a library for the single men living in bunkhouses and located it in the saloon building, recruiting the bartender to double as a librarian. Eventually, over 480 men worked at the Silver Islet Mining Company. They were a mixture of races and ethnic groups, including many Cornishmen who scorned the other foreigners and fought with them. Originally, William Frue had hired miners from the Keweenaw Peninsula in Michigan, but later he paid the passage to bring several hundred Norwegian and Cornish miners to Ontario. Some of the imported miners left because of the adverse working conditions that included a 60 hour work week. The Silver Islet Mining Company paid its miners $68 a month minus $14 for room and board and working conditions were deplorable, even by nineteenth century standards. At the end of each shift miners had to undergo body searches to make sure they weren’t making off with any of the silver to supplement their wages. Anyone who refused to be searched had to pay a $10 fine. Strict rules like rationing whiskey consumption also didn’t endear the Silver Islet Mining Company to its miners. The miners had no place to buy whiskey within 25 miles, so a black market of sorts sprang up on Silver Islet when a few venturesome peddlers sneaked in a wretched brand of whiskey on boats. The company decided to open its own saloon to eliminate the peddler bootleg traffic. The Silver Islet Mining Company set up its own whiskey system, allowing each man three drinks of whiskey per day, but not all at once. The company had fitted up a library and a reading room in one of its largest buildings and set up a bar at the end of the room. The bar was built so high and broad that not even the most agile miner could scale it to physically attack the bartender. In back of the bar a large blackboard sat and chalked on it were small numbered squares. The bartender assigned each miner a number, and whenever the miner wanted a drink he went to the bar, gave his number, and got his drink. The bartender made a chalk mark in his square on the blackboard and when the miner had accumulated three marks against himself, the bartender closed his account for the day. The miners sometimes fought with each other and a few murders occurred, but they also provided companionship to each other. From the time the last ship left in the fall until the first ship arrived in the harbor around April 1, the miners and their families had no contact with the outside world. The people on Silver Islet had to depend on their own resources and provide their own entertainment. They hunted the abundant wild game including moose, deer, caribou, bear, pheasants, partridges and ducks. They fished in Lake Superior for whitefish and lake trout and fished the stream that tumbled down the mountain by the cemetery for brook trout. They relied on each other to survive their dangerous, pioneer life style. Mining silver under Lake Superior was as dangerous as navigating the Lake that covered it. The power house and the shaft house were located at the northern end of the reef and equipped with expensive state of the art machinery. The miners loaded the ore into cars which ran on steel tracks, each car with a several ton capacity. The cars brought the ore up the shaft and again the men unloaded the cars and sent the ore on to be processed and stamped. The men traveled to their work in the mine under Lake Superior using a ladder down one side of the narrow shaft. There were no mining safety standards and every day the miners worked with the fear that their head candles would set trapped pockets of gas on fire. As the company extended the mine shaft deeper and deeper under Lake Superior, the terror the miners’ felt at being lowered beneath the lake increased with the depth of the shaft. Only a flimsy wooden and stone wall separated the miners from Lake Superior and the waves constantly battered it. By late October 1873, the shaft had reached a depth of nearly 300 feet under Lake Superior and for the first time water entered the shaft when a vein opened into a crevice from the lake. The shaft began to fill at a rate of about ten feet an hour and the miners fled for their lives. Then two heavy storms struck within days of each other, doing about $10,000 worth of damage to the cribs and break walls. Despite the danger, discouragement, and disasters, the men worked the Silver Islet mine enthusiastically and successfully for many years. The silver ore they mined the first two or three years consisted of “packing” type ore, rich enough for the company to ship it away in sacks and barrels for smelting. Some of the “packing ore” brought $7,000 per ton. Frequently the men found nuggets of pure silver and in 1873, they extracted nearly $550,000 in silver and they also mined 20,000 tons of rock, worth $40 to $50 a ton to be crushed in the stamp mill. At this point the mine shaft ran out nearly 1,300 feet under Lake Superior, with scattered levels leading away from the main shaft. Some shafts yielded poorly and brought fears that the mine had stopped producing. Then the miners would strike a bonanza shaft overflowing with silver ore. In 1873 when the mine had been operating two or three years, silver production suddenly dropped as steeply as the mine shaft, although the men had found evidence of richer deposits. Miners broke off a corner between the sixth and seventh levels of the shaft and took 65 tons of rock that yielded $113,000. Experts estimated that from $400,000 to $500,000 worth of ore could be seen in the roof of one part of the mine, but they decided not to build an artificial roof to mine the ore, because the deposits below were richer yet. In 1875, William Frue left the Silver Islet Mining Company and mine production lagged over the next three years, despite the capabilities of his replacement Richard Trethewey. The company brought in a diamond tipped drill and struck a new vein, but production still only amounted to $150,000 worth of silver, a deficit when compared to the cost of working the mine. In 1878, most of the original mine had played out, but the miners discovered a second vein. The stockholders organized a new company called The Silver Islet Consolidated Mining and Lands Company with a capital stock of one million dollars. After the new company pumped out the lower levels of the mine, in 1878 it took out over $800,000 worth of ore. The mine didn’t yield well in 1879, and in 1880, the output totaled a little less than $50,000. By 1883, miners had extracted the highest quality silver and the price of silver had declined. The Silver Islet Mining Company and the Silver Islet Consolidated Mining and Lands Company had expanded the original 90 foot island ten times its size and by 1883, one of its shafts reached 1,250 feet, nearly a quarter of a mile deep. The end of the mine came before the end of the 1883 shipping season and like the story of its beginnings, the story of the end of the Silver Islet mine has more than one version. The first version of the story says that in the late fall of 1883, a ship loaded with a cargo of coal from a southern port headed for the mine. The captain of the ship drank heavily and didn’t get his ship far enough north to reach Lake Superior before winter arrived. He abandoned the coal delivery and winter came with only a small supply of fuel on hand. The mine’s possibilities still seemed limitless, but possibilities couldn’t make steam. The second and more colorful version of the story says that the mine superintendent nervously noted that he only had enough coal to last until March first. The steam pumps couldn’t operate without fuel and without the steam pumps working, the mine would flood. The mine superintendent knew that the steam freighter H.B. Tuttle was coming with 1,000 tons of coal which would keep the pumps pumping until spring, so he told the miners and their families not to worry. January arrived with freezing temperatures and a frozen Lake Superior. February followed shivering cold, and work in the mine progressed slowly. Then one day the engines slowed and the last car of ore crawled up the incline that ran down below icy Lake Superior. The mammoth pumps spluttered and chugged and then stopped. The miners quickly left their levels and escaped into the icy air. Frigid Lake Superior water advanced up the shaft, inch by inch, foot by foot as the last ton of coal burned to ashes in the giant boilers. The engines spluttered to a stop. Mining had ceased in one of the most famous mines in the world. The Silver Islet mine had been one of the richest silver mines in the world. People considered it a marvel in modern mining and at one point the stock had sold readily at $1,500 above par value.. Many mammoth silver nuggets had come from Silver Islet mine, some so pure they didn’t need smelting and in over thirteen years of operation, it had yielded approximately 3.25 million dollars worth of silver, $1,300,000 in its first three years alone. Critics of the mine management argued that if they had been more frugal the mine would have kept paying good dividends and kept pace with its silver deposit fluctuations. Occasionally rumors of reorganization of the mine and prospecting of adjoining properties surfaced. People believed Silver Islet still held unlimited riches, but Lake Superior had the last word by sending its waters to reclaim the mine. He wrote about Captain John Cross, caretaker of Silver Islet, guiding their tour on a cold and gray day and rowing them back from the deserted reef. He noted that over on an island near the shore, he spotted blue smoke curling lazily to the sky from a clump of birches. The smoke came from the chimney of an old Cornish miner who still lived there. The old Cornish miner had spent his younger years working for the Silver Islet Mining Company and after it closed he remained searching for the missing vein which many people believed ran out from the reef to the mainland. .Seven years later, on a summer day in1910, a record 4,000 picknickers and cottagers visited Silver Island when the paddle wheel steamer Forest City carried passengers to Silver Islet. After the silver mines closed, most of the miners cottages were deserted until the Lake Coast Transportation Company bought them. The Lake Coast Transportation Company sold many cottagers and the Forest City brought cottagers and supplies to Silver Islet until the advent of World War I. One hundred years after the Silver Islet mine closed, wreckers were tearing down the old freight shed and they discovered a sealed shipping crate. Inside the crate they found the small tombstone of a miner’s child who probably had died during a typhus epidemic and they speculated that perhaps the miner didn’t have the money to pay for the tombstone when it arrived. The miner’s child likely rests in the tranquil cemetery which nature is gradually reclaiming, just as the waters of Lake Superior reclaimed the Silver Islet mine. Today Sleeping Giant Provincial Park occupies most of the Sibley Peninsula and the Thunder Cape Bird Observatory is located at its southern tip along with the small town of Silver Islet. Time has changed Silver Islet, but its story endures as timelessly as Lake Superior waves. Barr, Elinor. Silver Islet : striking it rich in Lake Superior. Toronto : Natural Heritage/Natural History, c1988. Excavating for a mine : Silver Islet, 1868-2008 : 140th anniversary / edited by Bill MacDonald. Thunder Bay, Ont. : Porphyry Press, 2008. Macfarlane, Thomas. Silver Islet. Montreal : Dawson Bros., 1880. Major Alexander Hamilton Sibley’s Sudden Death. New York Times, July 11, 1878. Pictures of Silver Islet, Thunder Bay Public Library.